Nest Cam IQ is a powerhouse of brains and brawn. Weatherproof, tamper-resistant and seriously sharp. So it can help you know about a break-in before it happens. 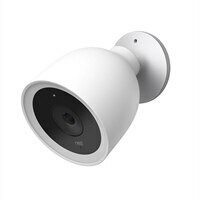 Nest Cam IQ Outdoor - Network Surveillance CameraNest Cam IQ is a powerhouse of brains and brawn. Weatherproof, tamper-resistant and seriously sharp. So it can help you know about a break-in before it happens. Good insight starts with incredible sight. Nest Cam IQ can detect a person far away, then alert you with a photo of who's there. Nest Cam IQ combines multiple 4K images to even out challenging lighting conditions. So details don't get blown out or lost in the shadows.